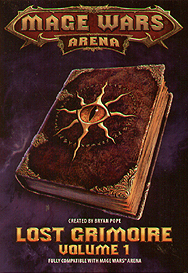 Within this Lost Grimoire, you will find 108 spells, that are unavailable in any other Mage Wars product. This product is compatible with all Mage Wars Arena products. There is something to enhance every play style, as well as a new trait... Trample! Trample allows large creatures to run over their enemies, dealing damage while they move. Enhance your spellbook with the knowledge contained in this ancient tome - it may be the advantage you need to vanquish those who oppose you in the Arena!